I started thinking of my project by looking at natural elements in the world around me on campus – fractal leaf shapes, clouds, the blossoms on the dogwood tree on Glen Washington Road. I was looking at the color and shape motifs in the works of Frank Stella and Yayoi Kusama. I am also very inspired by movement and performance artists, especially those who engage with earthwork. During the inception of this project, I was looking at Robert Smithson’s Yucatan Mirror Displacements. I thought about his introduction of foreign surfaces into the environment and how he used the human technology of the mirror to augment a place. I wonder how using Aftereffects can augment the textures and surfaces we experience in our lives. 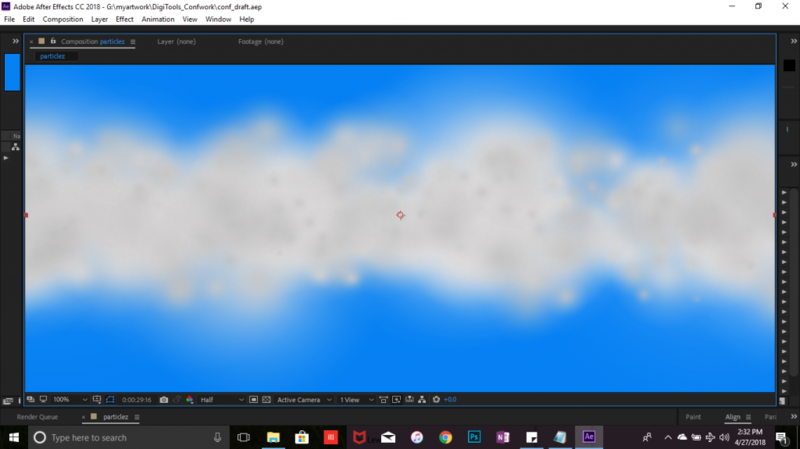 I became enamored with the particle effect, and so I attempted to play with the software and create something that could not exist under our current laws of gravity and motion. An initial draft sprang from a dream of watching blossoms fall upward. 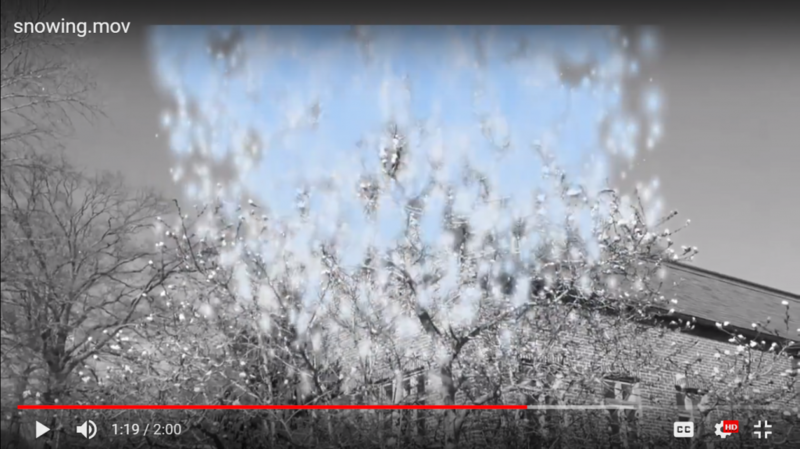 I animated a sequence somewhat like snow which I layered on top of a video. However, I received the critique that my personal interests in video art were at odds with the technical demands of the class. I realized that when making creative work, I have a habit of relying on my interests and current obsessions and allowing them to guide my workflow. I had to adjust my mindset to working consistently in small chunks of time rather than in large obsessive stretches. My hardest challenge was in stretching myself to find new ways to do things in order to create what I was imagining. After building the initial particle sequence, I felt dry of ideas for developing the sequence into a longer piece. In turning through my notes, I recalled our glitch assignment. 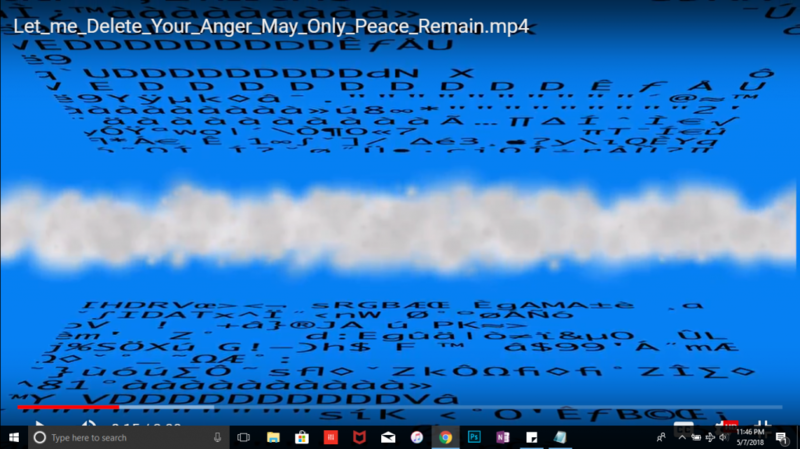 I spent a session making .png glitches of screengrabs of my blue and white cloud. However, although I’m really interested in glitching and would like to explore it in the future, I realized I had to make quick decisions and finish a polished project. After converting a .png file to a .txt file, I thought the text looked really interesting and had all sorts of graphic symbols like the apple that I could use. In the past, I have been drawn to work that makes the text into a graphic part of the piece. I decided making a text tunnel would be an appealing challenge that would help me practice my skills in building a tunnel and also develop my knowledge of the text animators. I wanted to make the fog blow through the tunnel toward the viewer. I copy and pasted sections from the long text document into the text box in Aftereffects. However, this method stretched the text box in undesirable ways and didn’t look visually pleasing. I watched a video for inspiration and learned to put the text into a separate composition with settings that made the comp long and skinny. This allowed me to animate the text in three dimensions like we learned in text studio. I then made a copy of the layer and flipped it, so that its animation would mirror the bottom layer. This was the most challenging part of my animation, because it required such close attention to the detail of the keyframes. I am still not completely satisfied with the symmetry; the top layer moves into frame at a faster rate for the initial 10 seconds before coming more closely into alignment with the rest of the tunnel. I think the simple color scheme of blue, white, and black is successful at creating the tone I wanted for this piece. I wanted to amplify the sense of harmonious symmetry by having the video form a complete loop. So, I doubled the length of my comp and applied a time reverse effect to the second half. The title refers the peaceful mood that this piece evokes in me. I like the idea of using glitching for good. Maybe the computer is refusing to process all the stressful data it receives and instead is sending a peaceful cloud into our minds. Or, it could be a sinister memory loss gas like the climactic scene of Janelle Monae’s Dirty Computer. I leave the interpretation to the audience.